The first ever police station in Shannon was built in 1902 on the street Nathan Terrace. The first police officer who worked in Shannon was John Robert Esson and he was the police officer from 1908-1911. Instead of using the Tasers and flash guns the police use today, the policemen used to use revolvers, bolt-action rifles, and wooden battens. For their transportation the policemen would walk around town unless they were chasing someone in a car. Whaea Hui quoted If you did something naughty you would get a growl and if you did something naughty again you would get a boot. I was too scared to do anything naughty because I never knew where the policeman was for all I knew he could be right round the corner. You even got scared just looking at his boots. The cars that they used to drive were Ford Falcons. 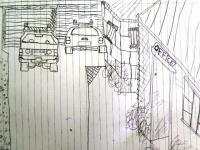 Whaea Hui described the cars as square box cars. When Whaea Hui was young the policeman was Benjamin Watson she described him as a tall and friendly man. Whaea Hui told us about the prisoners lies. ‘’I hadn’t seen this guy round for quite a while and when I did see him I asked him where he had been he said he had been working for HMQ (Her Majesty The Queen). It wasn’t for some time that I realised what he meant when he said he had been working for HMQ he had been in prison”. In 1911 early May Constable John Doyle moved to Shannon with his wife and family. He only worked in the town for a short period of time until he dealt with an incident in the Albion Hotel. One Saturday evening Constable Doyle was called to the back of the Albion Hotel, three men were there, found in a chaff room. Constable Doyle asked the three men to leave so they did. Later on that night two of the men returned to the Albion. John Doyle was called again to remove the men from the premises. When Constable Doyle arrived he asked the two men to leave they replied ‘’oh, we're having a sleep’’. Then a fight started between the three men, and one of the men Peter MacDonald kicked Constable Doyle in the shin. Doyle fell to the ground two men from inside came to help the Constable. Peter then struck again and hit Doyle in the eye and the two men pulled him away. Doyle was sent to the hospital with a broken leg, facial bruises and scars. Peter MacDonald was arrested, he appeared in the Magistrates Court on the 4th of February 1913. Peter was charged with assault, and the case was deferred for eight days. 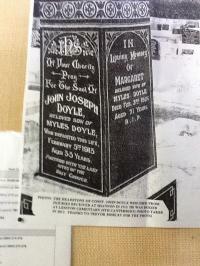 Doyle died on the 5th of February 5.30am. He died from Delirium Tremens, this was caused from shock in his badly injured leg. MacDonald was then charged for manslaughter. The Supreme Court trial began on the 20th May 1913. Peter MacDonald was sentenced to 18 months in prison.The memorial for Constable John Doyle sits in South Canterbury. The Shannon Jail wasn’t built in Shannon. It floated up the Manawatu River on a barge in 1911. The jail was moved to the first Police Station that was on Nathan Terrace. In 1964 the jail was moved to the second Police Station that was on the corner of Ballance and Venn Streets. The jail was last used in 1972. It was moved to Te Marie park. Whilst the jail was sitting in Te Marie Park some naughty kids set fire to the jail. It didn’t fully burn down only the ceiling. In 1996 the Council did not want the jail to be at Te Marie park any more so Owlcatraz decided to take the jail. Since Owlcatraz was a public place and anybody could go there they took the jail so the visitors and locals could visit and look anytime. In the prison the prisoners had a potty to do there business in. There was also had a hole in the door to give the prisoners food and water. There was a ball and chain for the horses so the prisoners couldn’t escape on their horses. The Police Station that stands today was officially opened by the Minister of Police Richard Prebble on the 6th July 1990. The PouPou (carving) that stands in front of the current Shannon Police Station are two carved posts. The PouPou was carved by my dad Henry Ropoama in 1992 when he was 18. Like all other Maori carvings there is always a meaning behind it and it represents something symbolic, special or personal. The PouPou my dad carved represents two warriors Tumatauenga God Of War (Left) and Rongomatane God Of Peace (Right). Brent Swanson (1989-2002) the current police officer at the time asked Henry to carve the PouPou as they needed a sign. Through our inquiry we have been able to build positive and healthy relationships with our community. Team effort by Bead (Year 8) and Shortae (Year 7). There was no police station in Shannon until December 1902. The jail was also known as the lockup. The lockup was first situated at the old police station on Ballance Street where the police rented the site. It was then moved to Te Maire Park because the Ballance Street property had been sold. Later it was moved again to Owlcatraz by a massive crane. The person who lives in the old police station nowadays has kept the original policeman’s office and he now uses it as a shed. We learned that Constable Doyle was attacked in the Albion Tavern Hotel. Constable Doyle was rushed to Palmerston North Hospital where he died the following day. His attacker was sentenced to eighteen months in prison. In 1935 our Shannon Constable Hugh Blaike collapsed and passed away while riding his bicycle. Mr Ross and Mrs Janette Campbell are the owners of Owlcatraz. The Shannon lockup is now proudly sitting in Owlcatraz. Mrs Campbell told us that back in the early days when criminals needed to go to the toilet they had to go in a potty. The lockup was last used in 1972 when the criminal who was in it tried to burn it down to gain his freedom. With the lockup safely at Owlcatraz more than four hundred thousand people have seen it. The lockup is very well looked after and this is great because so many more people can see it in the future. Thankyou Mr and Mrs Campbell. On the twenty-third of October, 1985 a man held up two bank officers arriving at the bank of New Zealand on Plimmer Terrace in Shannon. The robbers made off with about twenty thousand New Zealand dollars, The officers were not hurt during the crime scene and no arrests were made. The Shannon police station was a very busy place in late 1952, when a Palmerston North detective was shot while making enquiries. The two criminals headed for Shannon where they were arrested after a huge search. 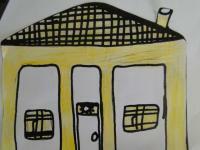 Team effort by Liam (Year 7) and Tristan (Year 6).